Audiograft is an annual festival of Contemporary Experimental Music and Sound Art curated by the Sonic Art Research Unit (SARU) at Oxford Brookes University, U.K. 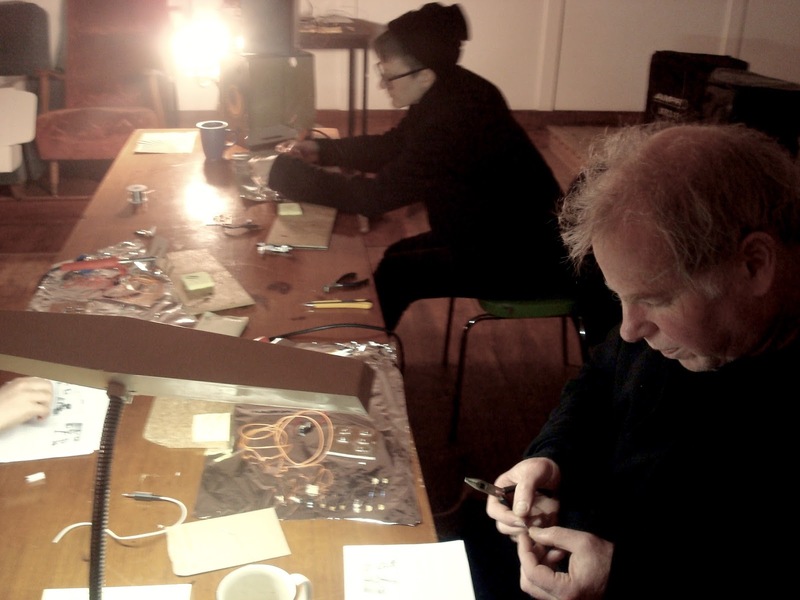 This year's programme ran from the 6th - 18th March and included performances of new experimental music and sound, exhibitions, artists talks and workshops. 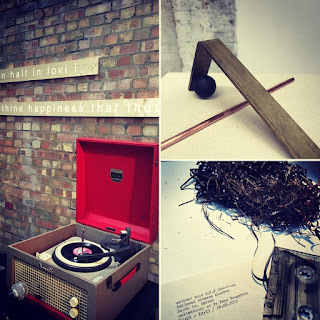 I could unfortunately not attend, although I did have a piece travel without me, to be part of the group exhibition that anchored the festival, shown at OVADA gallery, alongside installations by Kathy Hinde, Sarah Hughes, and Simon Blackmore. 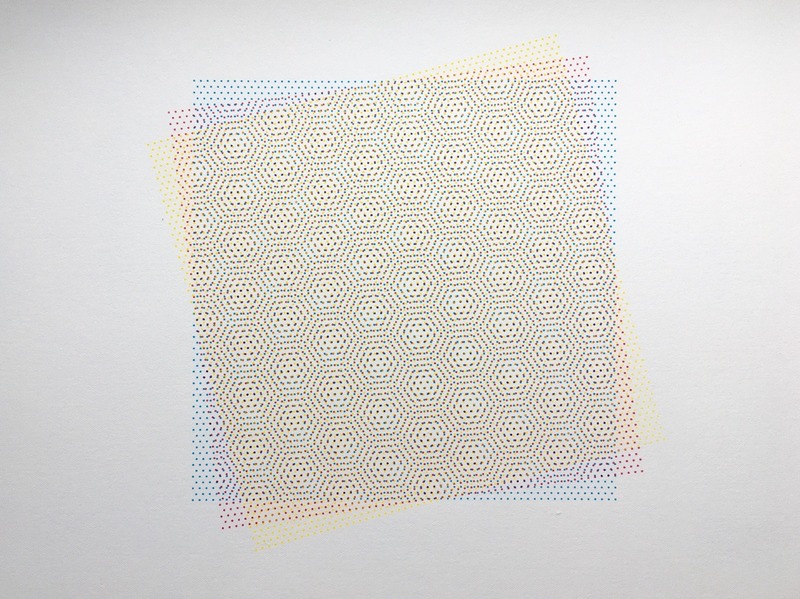 This was Study for a data deficient species (grey ghost transmission), which had evolved again through its previous installation iterations in exhibitions in Halle and Hobart, and the broadcast of a piece in the programming of Glasgow's Radiophrenia, toward an indexical simplicity. 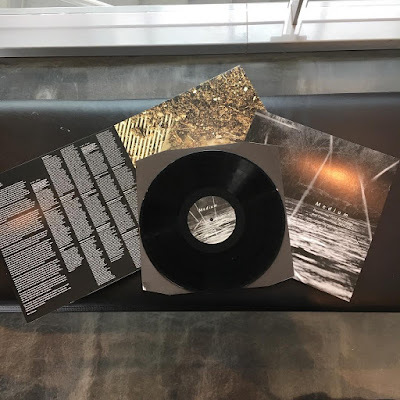 No live transmission in this iteration, but a more minimal presentation that predicated an emphasis on the catalogue, the sound object, and the listening experience as a recording with fixed duration. 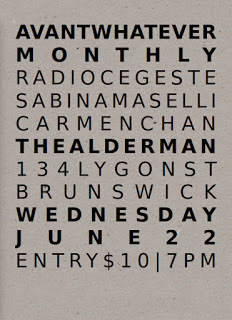 Thanks to Patrick Farmer, and all at Audiograft. images by Paul Capewell + SARU. It's January, and summer in Dunedin. The empty days are stark and long and bright, and there is a held silence to my part of the city, up on the ridge. A poise, as if the new year is delaying itself as long as it can, not quite ready to begin. Harsh, caustic, white South Island light, framed in the warped late-19th century windows, sketches across surfaces, creating heavily delineated geometries on scarred floors of native hardwood and 1930s celadon green attic room walls, an irregular angular architecture, shifting with the rotation of the day. The wind-torn doppler effect of exuberant childrens' voices normally audible from the school over the road is now silent, and my house is a wooden, many-caverned ear. Listening in to the tiny sounds of the outside. Its two stories are a creaking ship, cool and dark and solid, yet crooked open to the emptiness and brilliant light. I'm currently spending my time in this house working on a piece for Martin Nutt, the British-born, Japan-based composer, for a CD release in early March, as part of 2018's Audiograft Festival. This festival is held annually by the Sonic Art Research Unit (SARU) at Oxford Brookes University, UK. I'm one of a few artists sent the score for TMN. 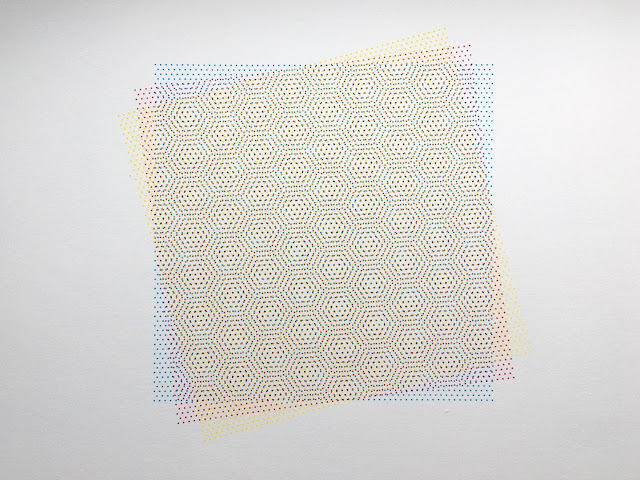 Trichromatic Moiré (2017). radio 33, broadcasting from Domain House, Hobart, as part of the Hobiennale, 3-12 November, 2017. 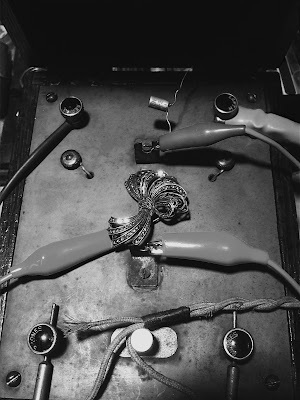 When operated in politically strategic ways, the contemporary aesthetic use of modernist technologies, like radio, can function as an effective localised antidote to a global technological homogeneity, one that ultimately flattens the field to a narrow bandwidth of expressive possibilities, within a homogenised focus on commercial interests. Joining other experimental and artist-run stations I know which are using the constraints of bounded technological space to critically address this set of conditions, is a small North Hobart micro-cast radio project called Radio 33, which specifically re-imagines radio, through the operation of month-long artist projects put into physical broadcast space as small scale, low power FM transmissions, as a potentially emancipatory medium, where communities can be built and the like-minded can connect with each other. 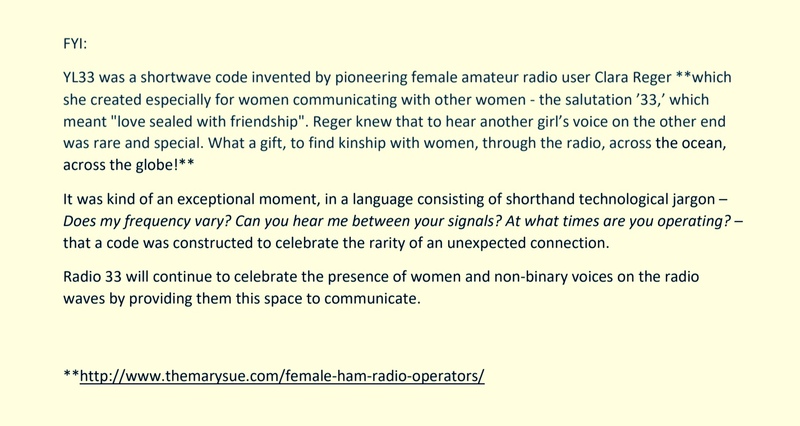 Radio 33's particular take on the minor and amateur literature of the airwaves is historicised within its careful listening to gendered histories of radio space, hearing them - and celebrating them - as a medium holding an ongoing structural continuum of self-identified female/non-binary voices audible since the medium's earliest days. 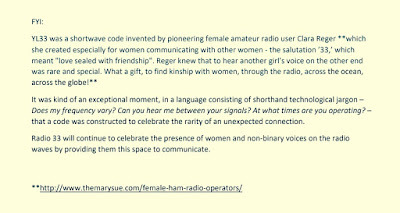 With core reference to the U.S. radio amateur/ham designation YL, instituted in 1920 by the American Radio League to designate a female operator, and amateur operator Clara Reger's subsequent YL33 code, coined especially for women communicating with other women, a salutation "considered sacred by female hams", Radio 33 recognises these historic women as kin and forebears, as well as the ongoing work it has taken, in the past and the present, for such voices to claim audible space, as - and for - themselves. 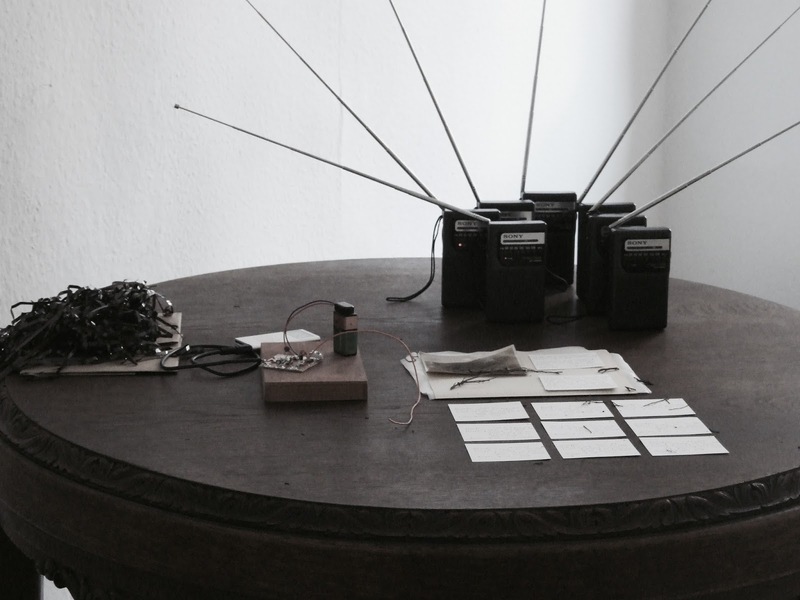 Tricky Walsh, the artist behind Radio 33, has been experimenting with the artistic use of radio in their work since 2011, and started this project at the beginning of 2017 as a radio station programmed as a gallery space for month-long artist projects: "I see it as less of a "program" than a virtual space anyone could 'walk' into and experience a sound work. just think of it as a gallery space made out of radio waves". 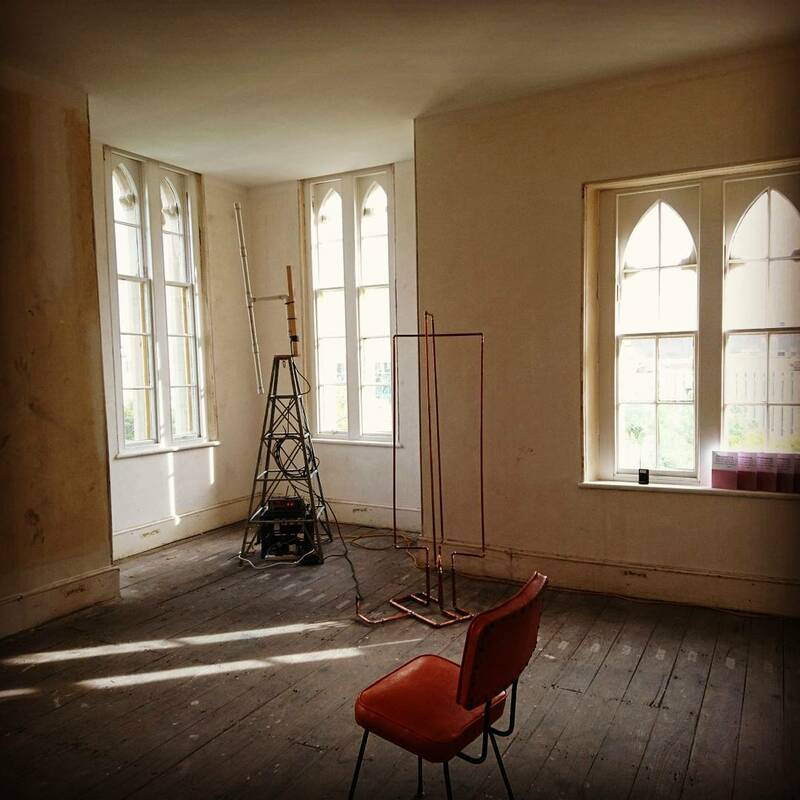 I was lucky enough to be invited by Tricky to be one of four 'ephemeral residents' in this on-air gallery space for the duration of the inaugural Hobiennale Arts Festival, from 3-12 November, in the beautiful upstairs attic rooms of Domain House in Hobart. 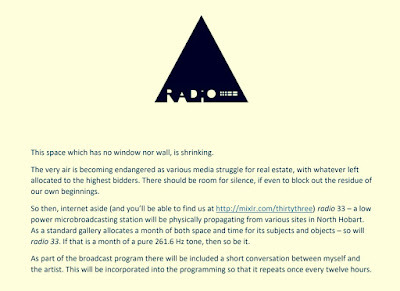 Radio 33 broadcast a compilation of my extant past and present sound and radio art works into this listening space, and after this first excursion into the possibilities, I very much look forward to developing new work for - and with - Radio 33 in the near future. thanks to Tricky, also, for the photographs and the text. I have a radio art piece included in the impressively extensive schedule of radiophonic experiment coming up in the programming of radiophrenia 2017, a temporary project station for radio art, broadcasting 24 hours a day from 6 - 19 November, out of Glasgow’s Centre for Contemporary Arts. This solid fortnight of radio, sound, and transmission art (from friends, peers and many new names), together promises to "promote radio as an art form, encouraging challenging and radical new approaches to the medium." a Deaf Cinema for Thylacinus cynocephalus. we call it life. We know no other. 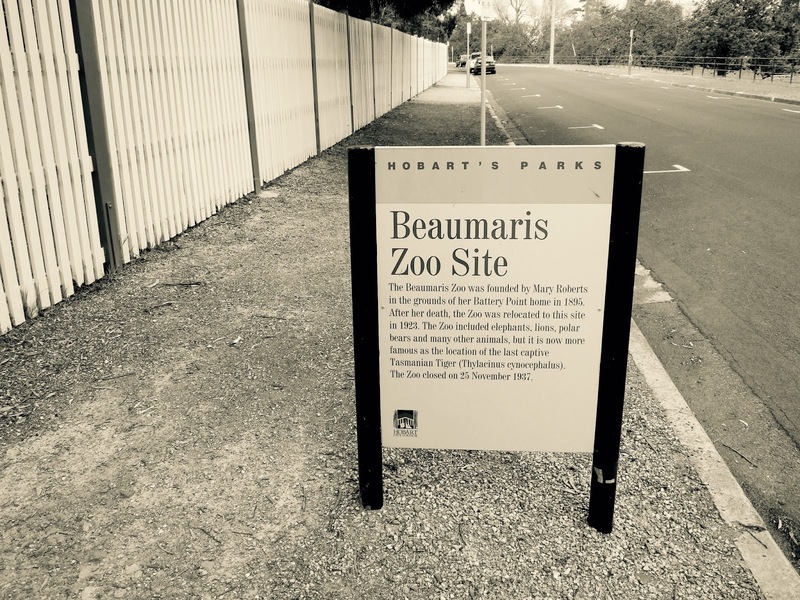 For a cultural heritage site of some significance, the former Beaumaris Zoo in Hobart is surprisingly overlooked. Over the course of a few days in October 2017, on the site of its derelict ruin (which is locked, and currently inaccessible to the public) near the Botanical Gardens in the Queens Domain, almost no-one comes by as I place highly sensitive contact microphones alongside various open-air microphones, to record whatever might be audible there. Together, both pick up the movement of metal and wooden fences and padlocked gates, the vibrations of structures in wind, the guttural croaking of endemic Tasmanian forest ravens and the eerie melodiously rhythmic warblings of black currawongs (Strepera fuliginosa) twisting in the air like mobiles or sonic DNA structures, the melancholy monotony of water falling from objects, the deep juddering of cars on the street going by from the same direction as the occasional, softer yet more startling human footstep, my own movements as observer. 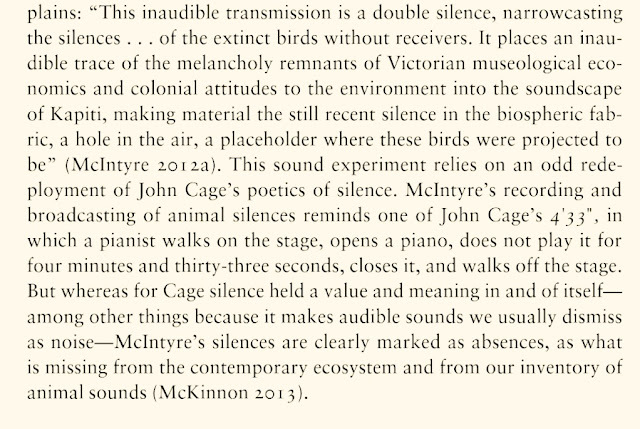 These sounds together begin to create a sightless image of the predominant life of the site, in absence of direct attention from people, which is also a gathering picture of the desolation of its abandon: an expanse of field containing a few crumbling, indeterminate concrete structures, a swampy area attended by Tasmanian native waterfowl sitting incongruously inside a ringed-off area of faded hi-vis tape. new writing by Meredith Kooi in Art Papers, Fall 2017 issue. my work was recently profiled in Meredith Kooi's feature "The Chorus at Dawn: An Aesthetics of the Tweet" published in the Fall 2017 issue of Art Papers magazine. Thank you, Meredith! 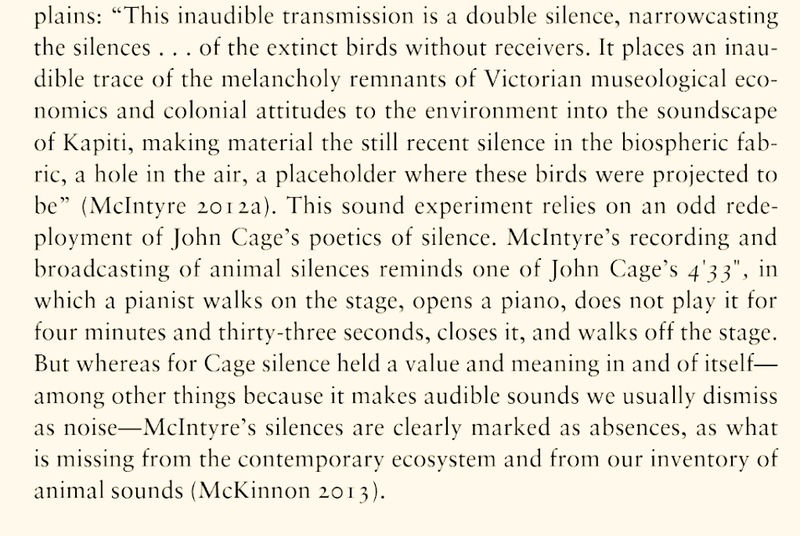 ""Talking to animals" such as McIntyre's extinct birds by using radio transmission - in what radio artist and theorist Gregory Whitehead describes as an "intricate game of position" that "unfolds among far-flung bodies, for the most part unknown to each other" - dissolves the boundaries between human and nonhuman worlds, perhaps it even transcends historical time." 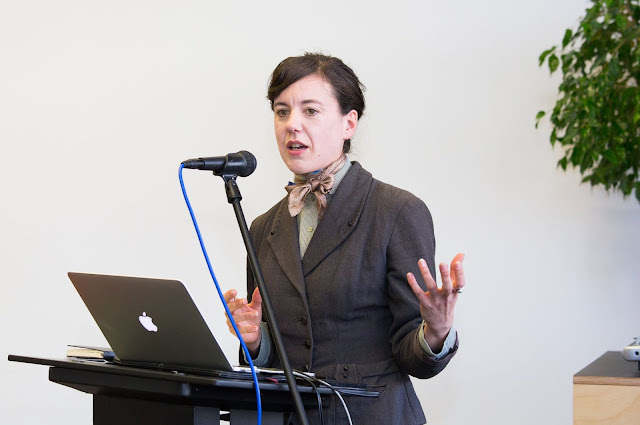 "McIntyre's works are simultaneously here and not-here, now and then, physical and intangible, audible and inaudible; the uncanny sonic and ethereal worlds she creates are ones marked by death and disappearance, strangeness and silence - discomfort we can feel in our bodies [...] In the event of a transmission, artists working in this medium bring otherwise elusive beings - often, phantoms - into the spaces we inhabit. Emerging out of, from, and into the electromagnetic spectrum, radio and transmission art allows us to experience being as both material and immaterial." An exhibition titled Medium, showing at the Zuckerman Museum of Art, Kennesaw State University, Kennesaw, Georgia, USA, between August 29 - December 3, 2017, will feature recordings from my project collected huia notations (like shells on the shore when the sea of living memory has receded). The exhibition considers the possibility of communication with the unknown, collecting together over thirty multimedia works from contemporary artists, as well as historical objects ranging from 1920s séance transcripts and Soviet Cold War-era “bone records", and archival materials from University of West Georgia, Ingram Library, Special Collections, William G. Roll Papers; the collection of Dr. Patricia Poulter; and the American Society for Psychical Research, Inc., the show "considers how intangible vestiges of the past haunt our contemporary world," aiming to "introduce a space to talk about things we don’t truly understand and to experience the impact of history as it lingers in our present." Medium is presented in conjunction with a vinyl record, Medium: Paranormal Field Recordings and Composition, 1901-2017, functioning as an audio supplement to the exhibition, which features sound recordings selected by Ben Coleman, including previously unreleased Poltergeist Recordings from the Society for Psychical Research in the United Kingdom as well as compositions by Dedekind Cut, Eluvium, and Frank Perry. In early May, London-based Australian sonic artist Mark Harwood and I collaborated on a piece for an event at the Wellcome Collection, organised by academic, poet, film curator and experimental geographer Amy Cutler. 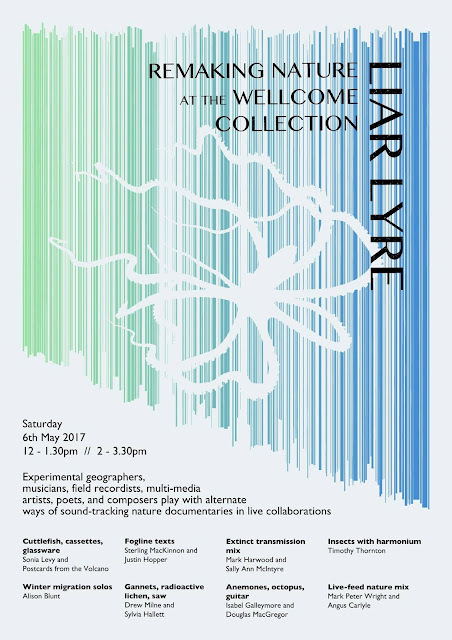 Liar Lyre saw "experimental geographers, musicians, field recordists, multi-media artists, poets and composers play with alternate ways of sound-tracking nature documentaries in live collaborations". The event was part of a weekend at the museum called Remaking Nature, and part of the preliminary public programmes to the exhibition A Museum of Modern Nature, which runs at the Wellcome from June to October. Mark and my collaborative performance stretched the distance between New Zealand and London through radio communication, tales of lazarus taxa, and speculations on nature and (neo)colonialism, critically re-soundtracking the first footage of the South Island takahē, or Notornis (Porphyrio hochstetteri), shot the year after its dramatic "rediscovery" in the Murchison Mountains, in 1948. It is now Autumn in Dunedin, the gathering days just after the daylight saving change. The tightening of light, where the magic-hour creeps into an earlier time-slot, and becomes a particular hue of grey-green-gold at a certain time of late afternoon/early evening, one that occludes certain colours and makes the khaki land look even more sombre, like a fading bruise with a yellow edge, or a piece of precious yet neglected metal, crusted with verdigris but still glowing pale gold through it. And then, just before sundown, the darkness seems to sit preemptively, visibly and heavily on certain objects, making them hard to see. The skin of whatever part of the body has been unwisely left at the mercy of the elements prickles against the gathering cold and darkness, with a kind of thrill that reminds the body it's alive, and that winter is coming and it better be ready. And the birds seem to know what's coming too. After a week working mainly at home in the near-silence of the hillside neighbourhood, every day has begun with a particular neighbourhood tūī, which is itself the exact colours of this landscape, chortling and sparking outside my window like a malfunctioning robot, before gurgling lower tones, sometimes completely inaudible - the bird is singing visibly, but i can't hear anything - and despite all the historic notation of tūī songs here on the table in front of me, i can't hear any of this experimentalism, in this supposed transcription of this bird's "music", only a historic human - and specific cultural (pakeha) - listening talking to itself, and leaving the bird out of things. it would be better to look at the sounds the bird is making as emergent properties of this place, too, and not abstract them in such ways, or relegate them to the airless space of a field recording on a harddrive, a dead museum of sound. I am so grateful that these beings are still among us, that they are some of the few that have survived, the few that can live with us. While our familiarity and sharing of space extends to conviviality to these birds as endemic, their over-depiction in sentimentalised often kitch representation also hides the fact of their complete otherness from us, the ways in which their song also contains a memory of the emergent properties of a landscape that we have actively destroyed, that we have never seen. Maybe the clues are here, in the song, rather than the archive. Today's research into the question : 'do birds hear bird song like we hear bird song?' (short answer : no) + other aspects of bird listening has produced various reflections on divergent evolutionary pathways, biosemiotics, the bald anthropocentrism of various prior models of listening, and the bare fact that humans really don't sense better, they merely sense differently, and perhaps in some ways, not as well: "300 million years ago when mammals split from birds, birds in some ways got the better deal." 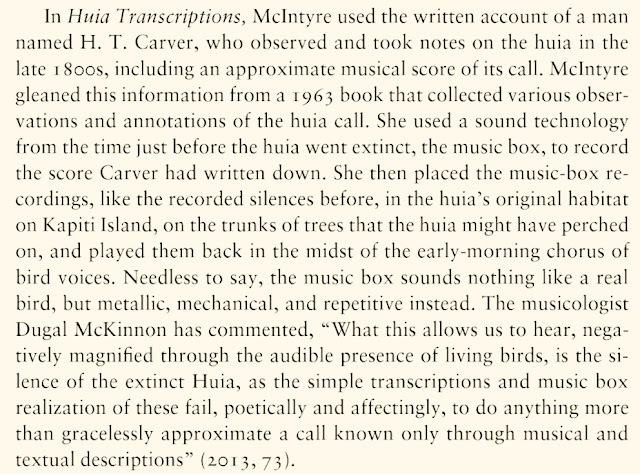 But all this could basically be summed up by the sentence: i wish i could hear what that tūī hears of its own song, when it sings. More to come, on that, I hope. on Feburary 12 radio cegeste was invited to perform at Quiet Noise VI, an annual house/backyard show challenging experimental/noise performers to play without amplification, curated by Clinton Green (of Shame File Music) in his suburban garden in West Footscray, in Melbourne, Australia. taking a somewhat baroque approach to this ideal opportunity to explore the theme of non-electric amplification, I brought a Columbia Graphophone Cylinder Phonograph (a very special Model Type AA, c.1901-1902, the "smallest talking machine" sold by Columbia; it plays 2 minute cylinders, and is all original including the horn) all the way from New Zealand. radio feature: "In Prototype Days: sounds and stories from the Sound Preservation Association of Tasmania"
In Prototype Days is an experimental documentary radio feature that details scenes in the everyday life of not-for profit small museum The Sound Preservation Association of Tasmania (S.P.A.T. ), located in the quiet suburb of Bellerive, in Hobart, Tasmania. The museum is dedicated to the preservation and display of historic sound technologies, and is a rich repository of devices and narratives which emphasise often localised and minor histories. The feature is told through the voices of the custodians of these technologies, some of whom have been working in radio and sound recording in the state for over 50 years. This feature was commissioned by Radio National's Soundproof program. It can be listened to here. "If the history of technology is a repository of memory, then it's not a seamless recall. 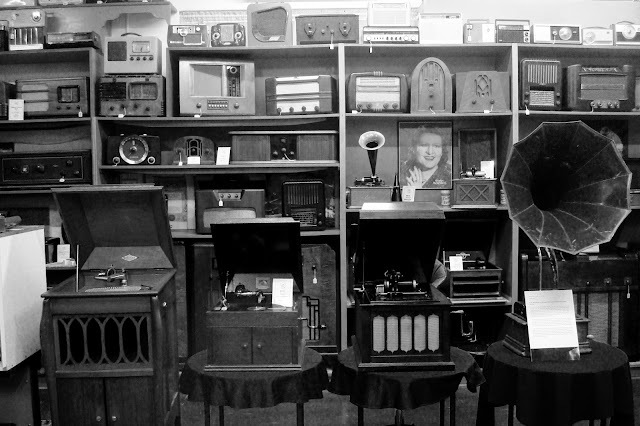 According to Lindsay McCarthy, president of the Sound Preservation Association of Tasmania (who himself first went on the radio waves in 1950), between the 1890s and the 1930s there wasn't anything recorded in Tasmania. 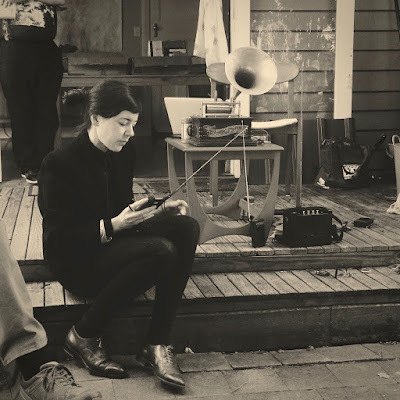 Much of what was recorded only survives in the archives of S.P.A.T., a small museum and archive devoted to the history of recorded sound, located in an old post office in a quiet suburb on the eastern shore of Hobart's Derwent River. 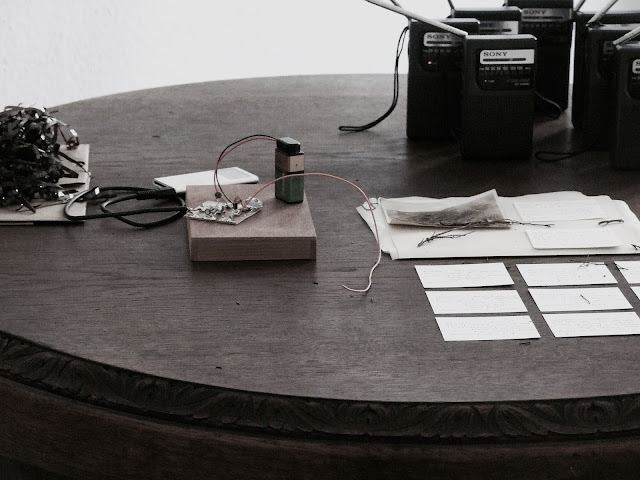 A love letter to amateur culture, In Prototype Days portrays scenes from the everyday life of S.P.A.T. Taking the lid off the museum's 'beautiful room', stacked floor-to-ceiling with hundreds of meticulously catalogued machines from the history of recorded and transmitted sound, alongside tens of thousands of recorded items from local and national audio history, presents a daunting, even overwhelming task.But as we walk into the room, memory gets specific. 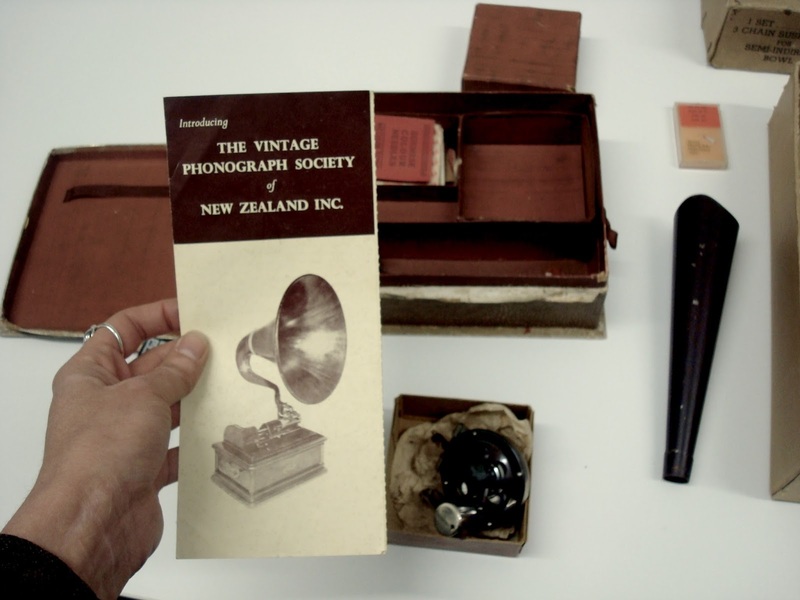 Within the walls of S.P.A.T., we hear the wonder of the simplest sound recording devices, like the Australian-invented card talk cardboard record player, made of folded cardboard and played with a steady hand holding a pencil at 78rpm, the sounds of once popular household playback devices like gramophones and phonographs, and tales from the pre-history of radio, when it was a rite of passage to make a crystal set by hand, with whatever was lying around the house." 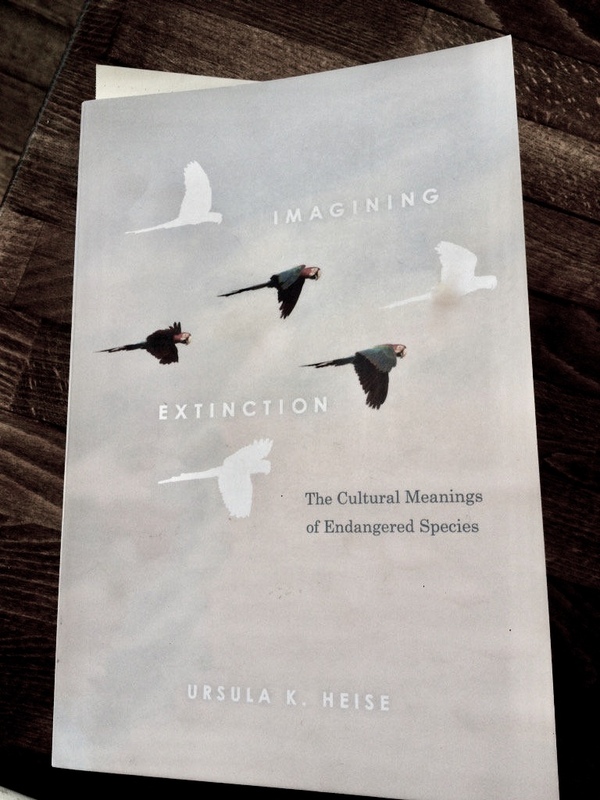 'Imagining Extinction: The Cultural Meanings of Endangered Species', Ursula K Heise. I was pretty chuffed to find out recently that Ursula K Heise, author of Sense of Place and Sense of Planet: The Environmental Imagination of the Global has written about my work as a case study in her new book Imagining Extinction: The Cultural Meanings of Endangered Species. The University of Chicago Press writes the following about the book on its website: "We are currently facing the sixth mass extinction of species in the history of life on Earth, biologists claim—the first one caused by humans. Activists, filmmakers, writers, and artists are seeking to bring the crisis to the public’s attention through stories and images that use the strategies of elegy, tragedy, epic, and even comedy. 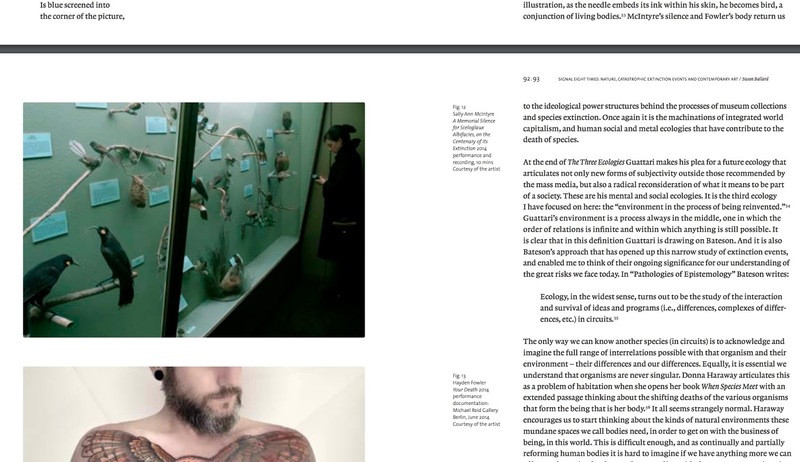 Imagining Extinction is the first book to examine the cultural frameworks shaping these narratives and images." 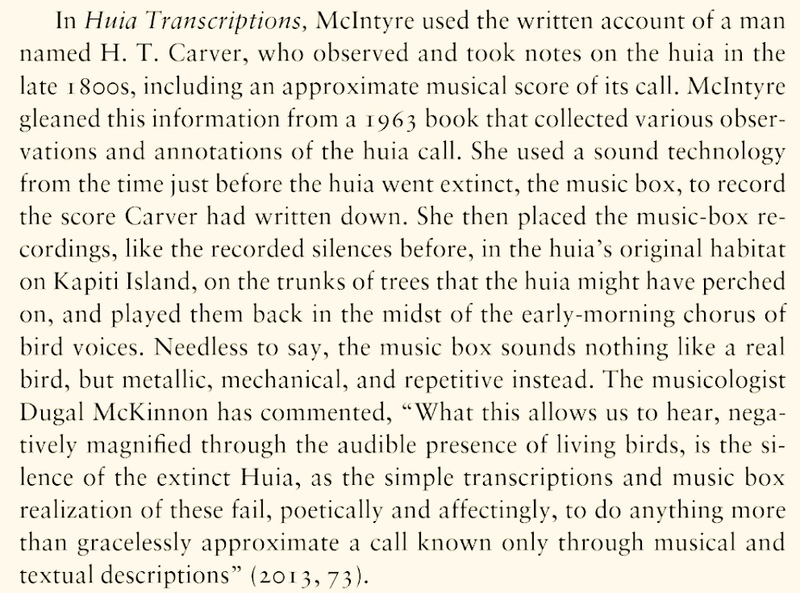 Discussion of two works "Huia Transcriptions" and "Collected Silences for Lord Rothschild", exploring extinction, silence and silencing in the postcolonial environment, and the subject of cultural mourning of the nonhuman, are included by Heise. It's an absolute honor to be represented in this context, and I thank Ursula for seeing how these works might speak in their own small ways to an important and necessary wider discussion, alongside so many other thinkers, writers and artists whose work I value so greatly. 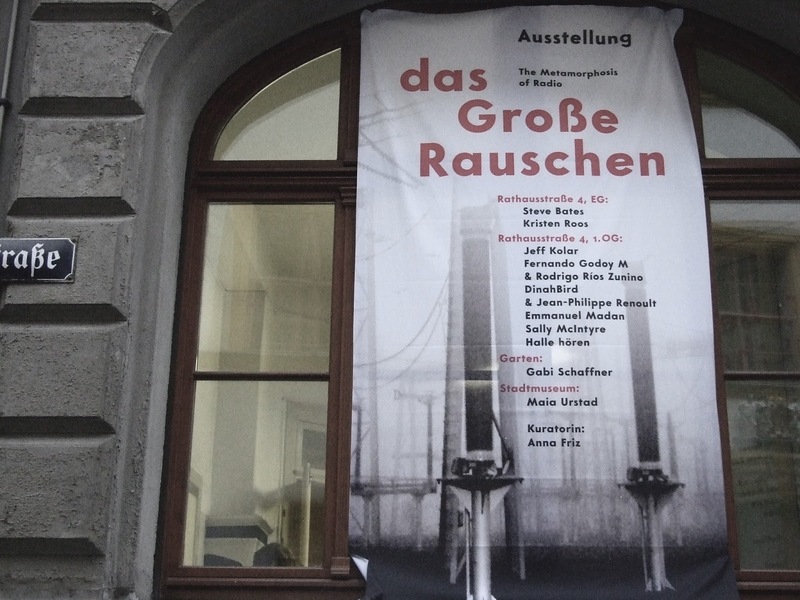 'Das Große Rauschen: the Metamorphosis of Radio' at Radio Revolten Zentrale, Halle. arriving in Germany to be resident for the month of October in the city of Halle (Saale) to participate in the Radio Revolten International Radio Art Festival, I am joining more than 70 artists from 17 countries who will visit this month to contribute in a variety of ways to the festival, at the invitation of artistic director Knut Aufermann, and co-curators Anna Friz, Sarah Washington, Ralf Wendt and Elisabeth Zimmermann. That’s 30 non-stop, exciting and exhausting days of contemporary radio art, at 15 locations around this small and picturesque city, in the form of performances, site-specific installations, concerts and events, and live radio broadcasts, as well as discussions in the upcoming symposium Radio Space is the Place. The festival will be transmitting 24 hours a day on Radio Revolten Radio, on the FM frequency 99.3 MHz in Halle, further afield locally on the AM (middlewave) frequency 1575 kHz, and reaching a worldwide audience via the festival livestream. 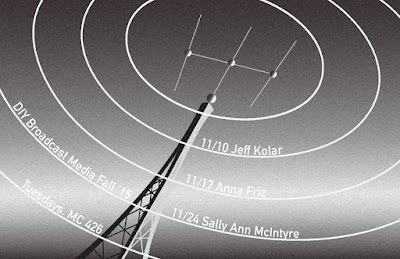 Additionally, 35 radio stations around the world will integrate parts of Radio Revolten Radio into their own programming, including Resonance FM, Radio Zero, Wave Farm/WGXC Hudson Valley NY, and other stations involved in the Radia network, whose members will also take the opportunity to converge for a two-day meeting and thinktank at the studios of Halle's Radio Corax during the festival. transmitter building workshop, part of the B.Y.O. BATTERY series. 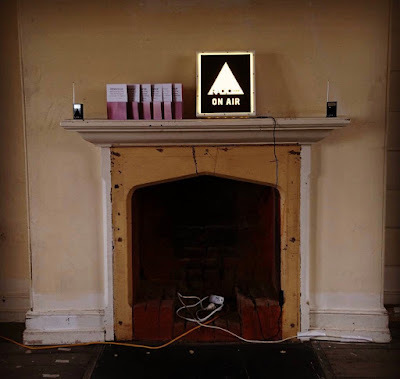 on July 24 I hosted a mini FM transmitter building workshop for ten people at The Anteroom, an non-profit artist run space based in an ex Masonic Lodge in Port Chalmers, run by the media artist Charlotte Parallel. The workshop was part of a series of D.I.Y creative technology and skill-sharing events Charlotte curated called 'BYO Battery'. 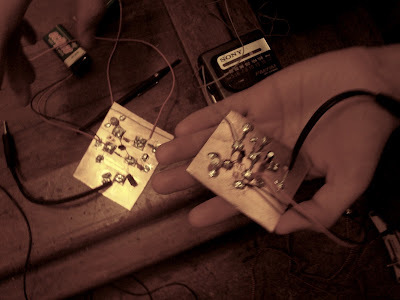 This workshop's intention was to make transmission technologies accessible, with participants constructing their own simple hand made ultra low watt transmitter with which to narrowcast their own sounds. Grounding this practical making within wider theoretical reflection and discussion of how DIY analogue technologies might inform our understanding of communications within the post-digital present, drawing on the histories of DIY radio making and free radio experiments in 1970s and 1980s Italian and Japanese media art and activist histories, we also discussed the use of transmission media for artistic and non-centralised cultural purposes. With participants coming from various backgrounds, including dance, experimental music, and film, it was a stimulating day. True to the spirit of the series, everyone also brought along their own 9v power source. On the 14th of July at 1pm I gave a performance/lecture at the National Library, Wellington, in response to Zombies on the Horizon, an exhibition drawing on archival collections to tell a lateral story of the development of experimental music in Aotearoa, put together by the National Library's music curator Matt Steindl for the Turnbull Gallery. This exhibition takes its name from a statement by composer Douglas Lilburn, who begins the show's own narrative, talking about the coming of electronic media within music culture as "the zombie on the horizon". 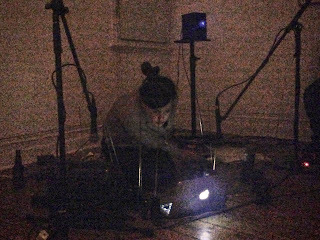 I also took this as my own lateral starting point, speculating how Lilburn's statement might be seen in relation or contrast to the notion of Zombie Media, recently elaborated by Jussi Parikka and Garnet Hertz, particularly in relation to an 'archival turn' within sound art cultures. 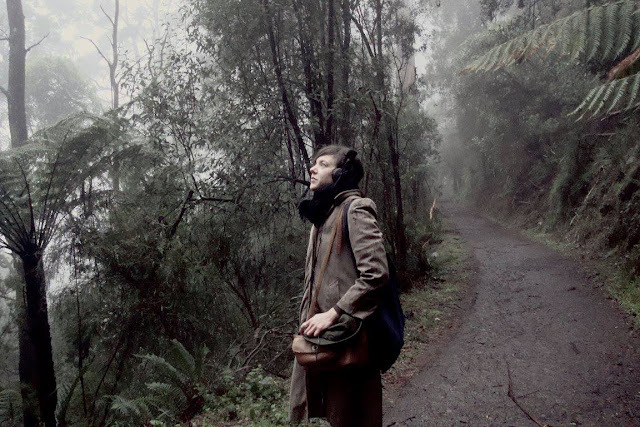 tracing the source of the signal only opens the noise of the field (talking to the lyrebird about copyright) is a site-specific research project currently being conducted as fieldwork by radio cegeste in the location of Sherbrooke Forest, in the Dandenong Ranges, about an hour out of the city of Melbourne, Victoria, Australia. The project traces a particular vein of pioneering Australian broadcast and field recording experiments beginning in June 1931, and conducted throughout the 1930s. 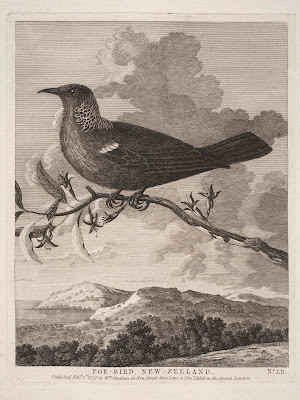 In this period, the nascent development of audio transmission and storage technologies became momentarily fascinated with the recording abilities of a particular bird species. 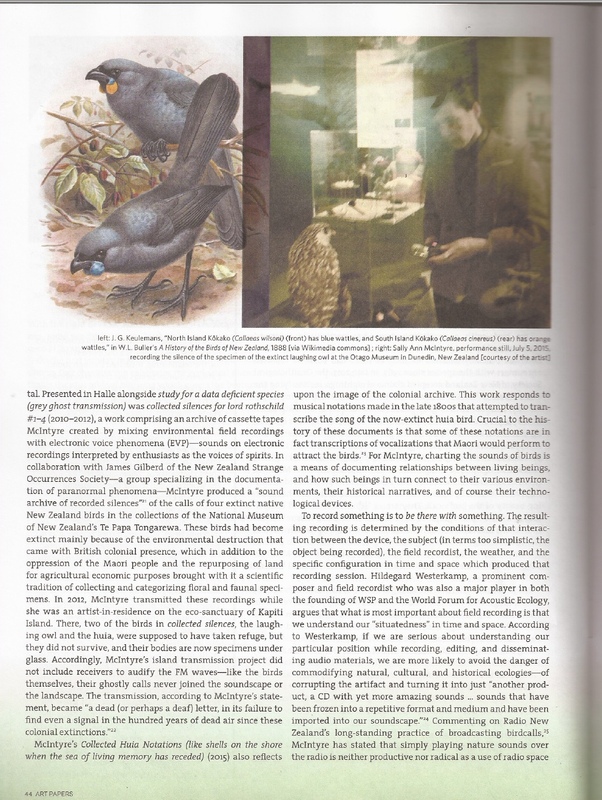 In their paper, First Sound Recordings of the Lyrebird, Peter J. Fullagar and Ederic S. Slater compile a useful evaluative overview of this history. 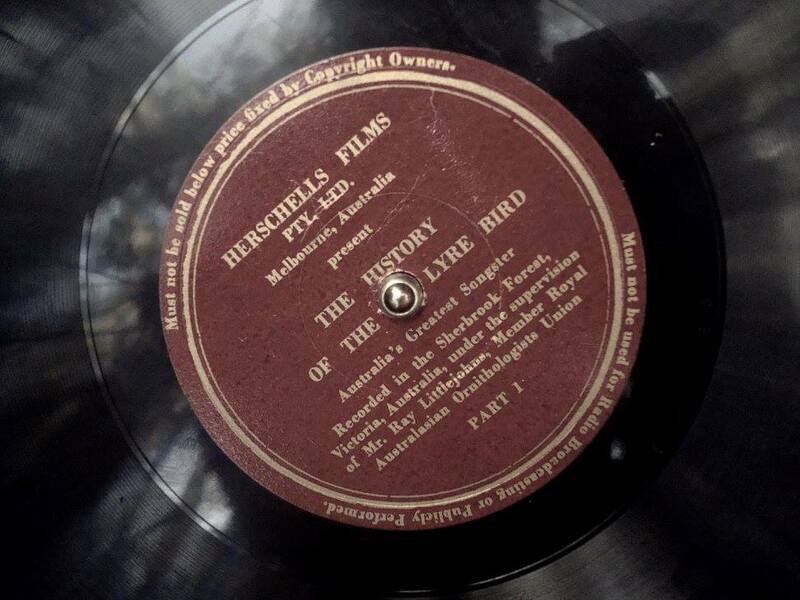 They describe the first recording (on the optical soundtrack of film) and the first (non-live) transmission: "The first sound recording in Australia of a wild bird was made 28 June 1931. On that day the song of the Superb Lyrebird Menura novaehollandiae was preserved on sound-film in Sherbrooke Forest in the Dandenong Ranges, east of Melbourne. Australian Sound Films Ltd. made this historic recording with the assistance of Ray Littlejohns who was at the time completing a film on lyrebirds. The recording was broadcast during the evening of 2 July 1931, from a radio station in Sydney. Until this time all attempts at recording the song of the Superb Lyrebird in the wild had been frustrated by lack of suitable equipment with all previous efforts being of unacceptable quality." These field experiments went on, and a subsequent session produced the first Australian commercially available sound objects of a wild bird: "The recording used in the production of a gramophone record was made on 29 May 1932; repeating the field recording methods used in 1931. This record was issued in late 1932 or possibly not until 1933. 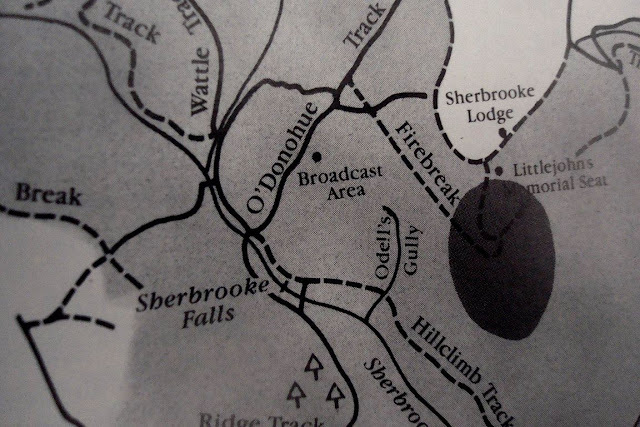 Further recordings on sound-film were made in Sherbrooke Forest; one of special interest being a 45 minute recording made in 1934 which was subsequently used in preparing the soundtrack for the film on lyrebirds produced on behalf of the Commonwealth Government by Ray Littlejohns." 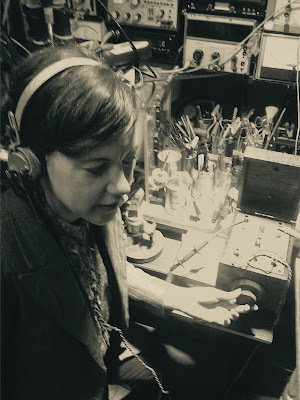 But the 1931 experiments also included live transmissions from the field: "The first direct broadcast of the song of the Superb Lyrebird went to air on Sunday morning 5 July 1931, following some earlier test transmissions in Melbourne. This broadcast, by the Australian Broadcasting Company, was made from Sherbrooke Forest with various telephone and land-line connexions making it possible to relay the signal for simultaneous transmissions out of Melbourne, Sydney and Adelaide radio stations." 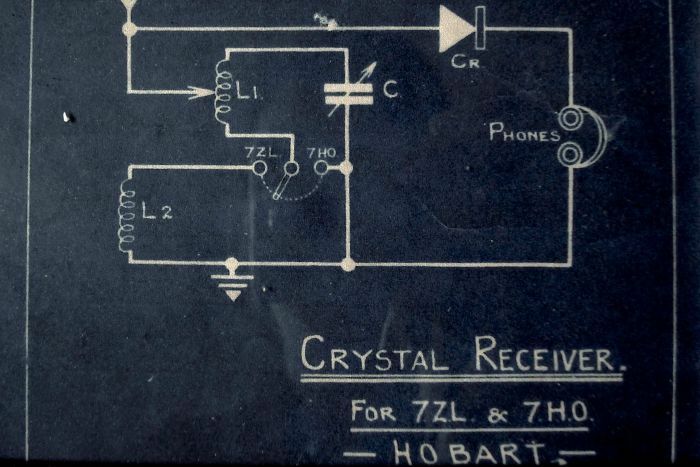 The July 5th transmission also reached further, across Bass strait to Tasmania: "Reception was hailed as excellent; indeed, reception of this transmitted signal in Tasmania allowed for re-transmission from a radio station in Hobart." It was also heard live across the dateline: "A short wave overseas transmission of the broadcast on 5 July 1931 was provided by Amalgamated Wireless (A’asia) Ltd. and reception was confirmed, at least, from North America. Broadcasts of Superb Lyrebird song from Sherbrooke Forest were transmitted in 1933 and 1934, including further short-wave overseas transmissions." 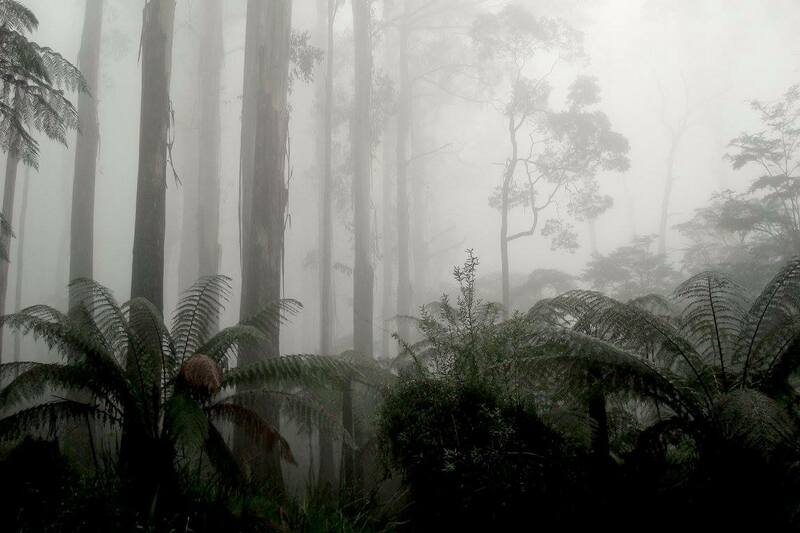 In June 2016, during the depths of winter (which is Lyrebird breeding season), I traveled to the Sherbrooke forest on an initial field trip to conduct the first of a series of sonic re-mediations, undergirded by an exercise in investigative biomedia archaeology, researching and recording the site of the 1931 and 1932 recordings and broadcasts of the first wild bird in Australian media history. I took with me on this trip an 'original copy' of the 1932 gramophone record (from my own collection), which was one tangible object which emerged from these initial collisions of site, species, and technological invention, as well as a gramophone player on which to play back this record to the (presumed - Lyrebirds are extremely territorial, and don't roam far over the generations, a fact reflected in the content of their sonic repertoire) descendants of the single Lyrebird captured on it. In this exercise I was assisted by members of the Sherbrooke Lyrebird Survey Group in (approximately) identifying sites, and while in the area I also joined their dawn survey session the next day, and recorded the sounds of these dedicated citizen scientists in their work, as well as the dawn chorus of Lyrebirds in the forest. The 1932 record, recorded on the 29 May and released later that year or early the year after, is credited to "Herschells Pty Ltd. Sound Picture Producers Melbourne, recorded in the Sherbrooke Forest, Victoria, Australia under the supervision of Mr. Ray Littlejohns, member of Royal Australasian Ornithologists Union. Dialogue by Mr. Alfred L. Samuel." "His mimicry is almost uncanny and in addition to his wonderful repertoire you will hear above the roar of the wind in the forest, perfect imitations of - the Butcher Bird, the Kookaburra, the Australian Thrush, the Whip Bird, the chuckle of a flock of Crimson Parrots, the Pilot bird, the Black Cockatoo, the Honeyeater... You will also distinguish what appears to sound like a man hammering a fence, a water pump in action, a Dog barking the warning cry of a White Cockatoo, the chuckle of a domestic Fowl and a man whistling for his Dog." 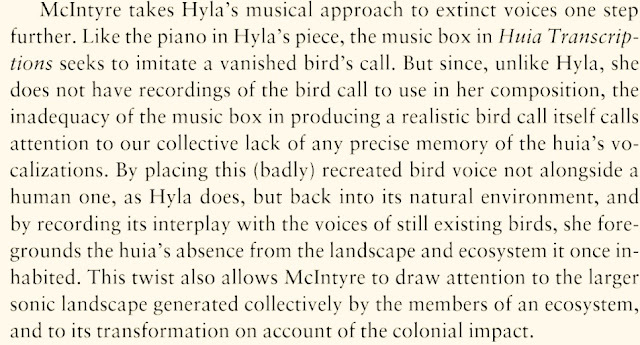 Side A of this recording is a voiceover narrative, which functions to construct a setting of romantic wilderness, a framework into which a recording of a single lyrebird is placed, a "wild Australia" in contrast to the home listener's position in their domestic sitting room: "Don't forget that what you are about to hear", the male voiceover says, is "a bird singing its own wild song, with "the nearest human being almost a quarter of a mile away." 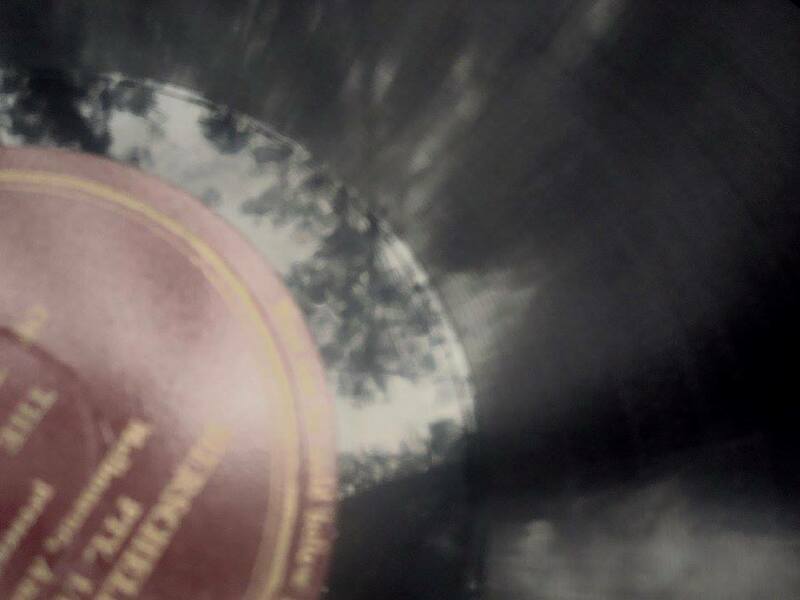 The record is copyrighted as follows: “Melbourne: Herschells Pty Ltd, 1932. 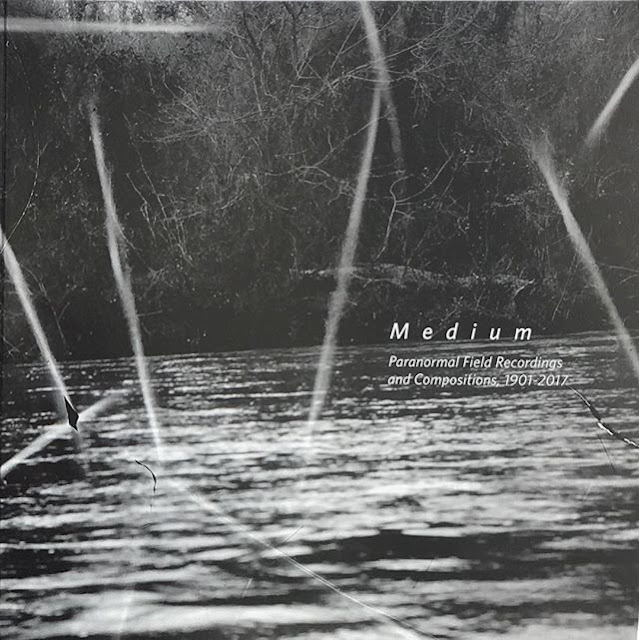 Recorded in the Sherbrooke Forest, Victoria, Australia, under the supervision of Mr. Ray Littlejohns. Must not be sold below price fixed by Copyright Owners. 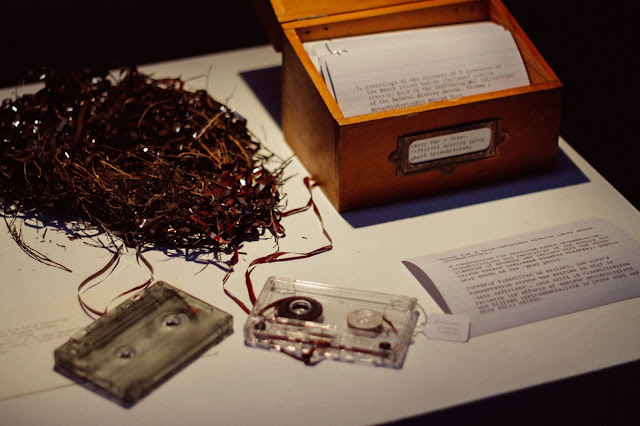 Must not be used for Radio Broadcasting or Publicly performed.” No-one apparently asked the Lyrebirds whether they had given copyright clearance for their sounds. 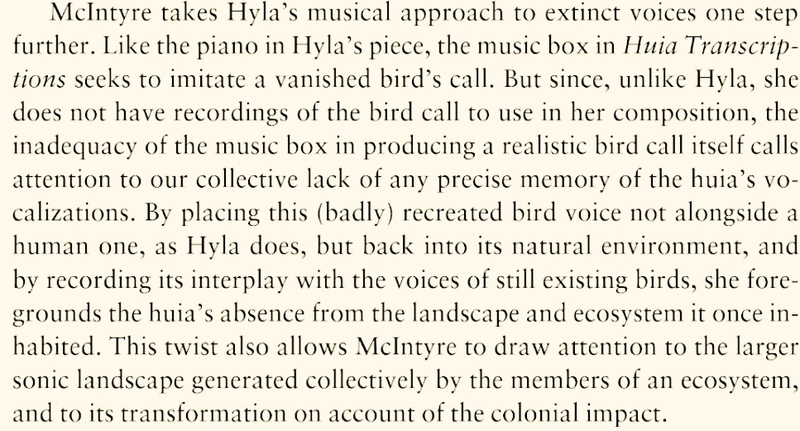 In the re-recording I made on this initial field trip, the record was taken back to the place (as closely identified as I could manage) where it was recorded over 70 years later, to produce a new residue of its playing to living Lyrebirds (a performance without human listeners), who are presumed to be direct descendents of the historically recorded bird. Listening back to the recording I made that day, the calls of various distant Lyrebirds in the present time of the 2016 recording echo that of the 1932 bird, their long-dead ancestor on the shellac record, but they also overspill the record's narrative framing, to answer, to speak back, to include their own voices in the recording, to include the recorded voice in their own transmission (broadcast/reception) space. They seem to "mock" the plummy radio voice of the narrator as he praises them for their mocking-bird abilities, and his efforts to systematically set out each incidence of mimicry as a catalogue frozen in time. Other sounds recorded on site include wind in the trees, human voices (of passing tourists), rain and other species of birds. 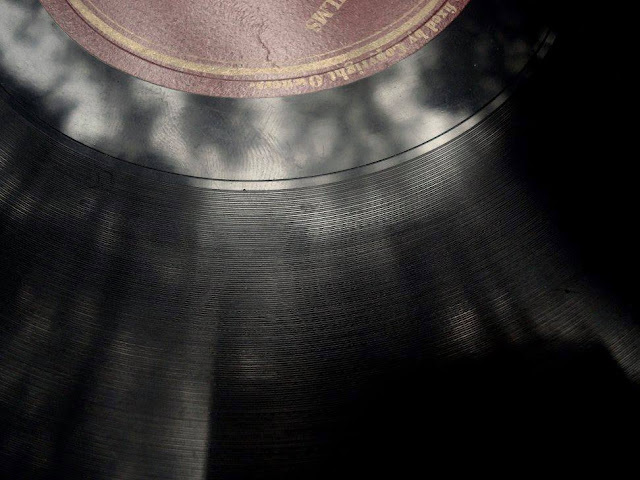 The collision of the two times – 1932 and 2016 - destabilizes both the constructed soundscape of the record and the integrity of the location recording. Many thanks to Jan Incoll (a.k.a "The Lyrebird Lady") and all involved with the Sherbrooke Lyrebird Survey Group for the dawn cups of billy tea, the companionship, and the tolerance of microphones. More field trips and other experiments and formalities are planned for this project. Stay tuned. a brief post-midnight birthday-morning experiment / work-in-progress report. the first vaguely successful attempt at materialising an object i've been thinking about for quite a while now, which has the working title of 'marcasite radio' and is, essentially, an experiment in 1920s residual media, based around the speculation that the white iron pyrite that was used to make marcasite jewellery in the 1920s and 30s might also be able to be used as the crystalline mineral in a crystal detector. I'm pleased to be able to report initial success - when set into a crystal radio receiver of the same era, my maternal great grandmother's marcasite brooch becomes a radio mineral, a diode that faintly speaks the voices of the aether. her name was Ann Wright (i'm named after her) and she was born in the 19th century, and was 101 when she died. (as of around an hour ago, i'm 59 years younger than that milestone). After quite a few years of searching for them after the museum where they were housed was destroyed in the 2010-2011 Christchurch earthquakes, I've recently come into possession of copies of Ann's oral histories, taped in the 1980s, which detail fragments of the everyday life of the small town of Kaiapoi, located just outside Christchurch, in the early 20th century, among static hiss, noise, and the lapses of memory. Ultimately I am hoping to use these taped gaps, erasures and traces as the basis of a composition which can be channeled back to radio, transmitted via the active collaboration of the brooch and the ring she wore at the time, and which currently remain mute witnesses of those histories. My mother gave me the two pieces of Ann's marcasite jewellery I am using in this experiment, as a graduation present. I wear the brooch in the same place I sometimes clip radio cegeste's transmitter aerial when performing. 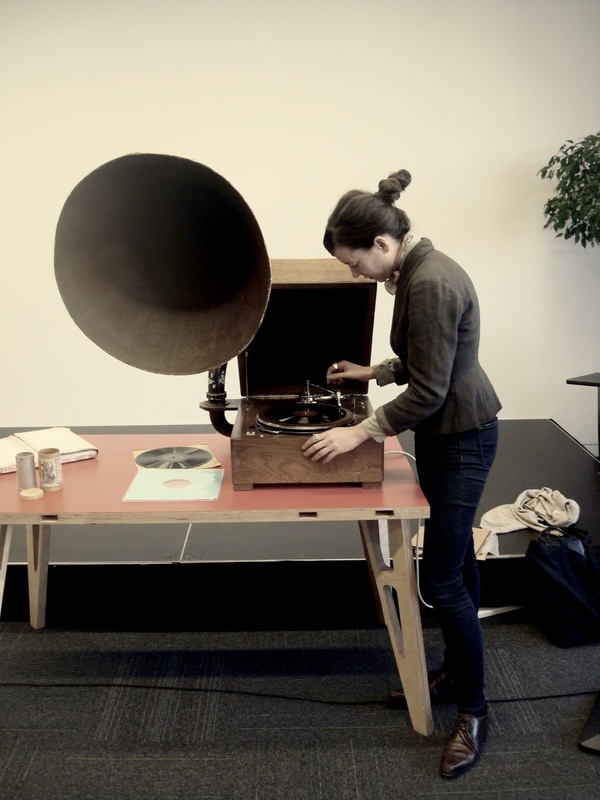 I hope neither of them are too offended by me re-purposing such exquisite heirlooms (taonga) to channel aetheric-material ghosts, while also thinking back toward the work of this country's female radio pioneers in the first decades of the 20th century. 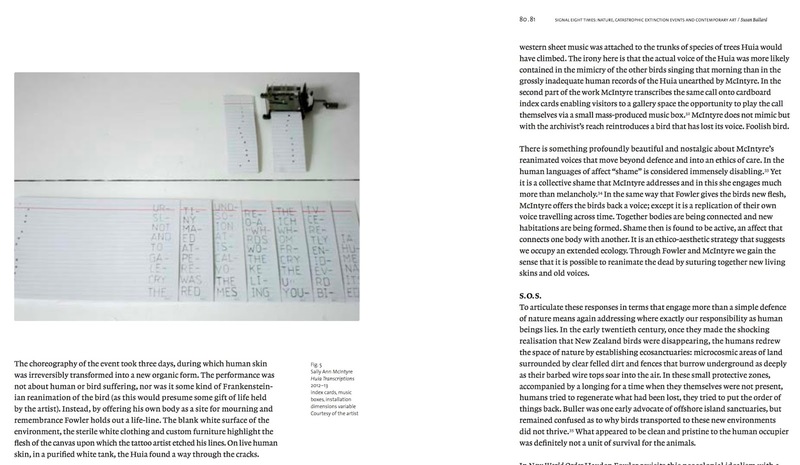 issue 7 of the Auckland art Gallery's research publication Reading Room: a Journal of Art & Culture, with the theme of 'Risk' features Susan Ballard's paper Signal Eight Times: Nature, Catastrophic Extinction Events and Contemporary Art. since (at least) 2014 Su has been writing in erudite and localised manner about Australian and New Zealand artists who take the extinction of nonhuman creatures as a theme. An early version of the paper, which she presented at the conference Affective Habitus: New Environmental Histories of Botany, Zoology and Emotions, was called More than the simple defence of nature: Artists confront extinction. In her blog, Su writes of this paper that "the title comes from a passage in Guattari’s Three Ecologies where he highlights how humans are part of nature, they are ‘in’ nature, so cannot defend it. He says more needs to be done if we are to survive IWC (Integrated World Capitalism). I talk about some NZ and AU artists who have been thinking about NZ bird extinctions, and suggest that they are already doing ‘more’. 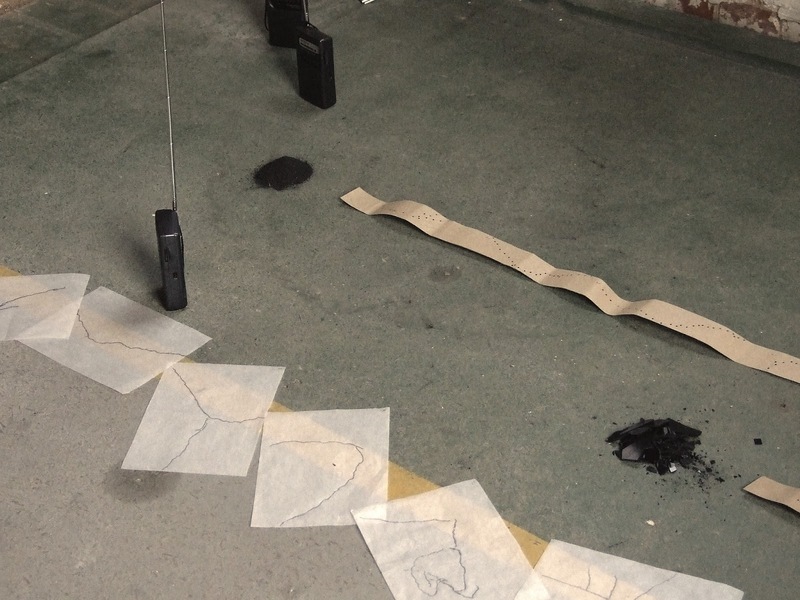 These art works are not a defence at all but a reenactment of environments." Within the wider scope of her discussion, Su weaves two of my projects into this latest version of the paper, pairing their focus on the sketchy musical notations of colonial-era pakeha contact with vanished birds still extant in contemporary archives, and the silence which remains in the present of museums, with other artists and works. She writes: "I argue that in staging small moments of encounter, which remind us that our experience of the environment is intimately tied to the survival of ideas, contemporary works of art can help us think about extinction anew." 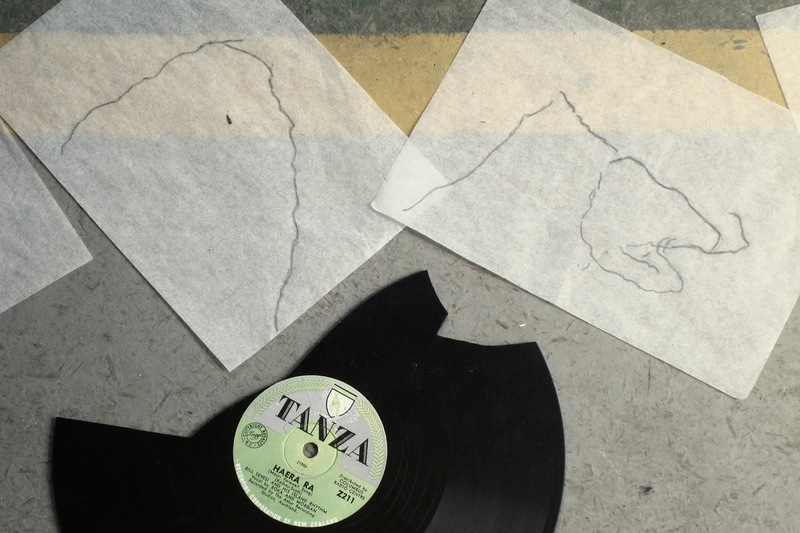 notes: a sound score is constructed from a Dunedin street, using the location. 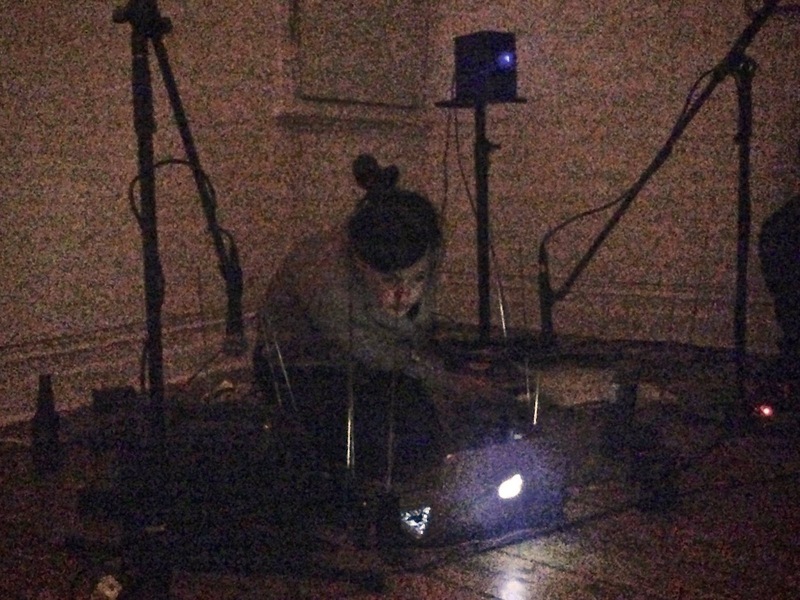 In its initial stages, this score is a textual response to the idea of “land reclamation” and the fact that this street is on a part of the earth that was, until recently, underwater. It progresses further into the investigation of tidelines from various eras between the 1840s and 1890s, which inched forward from the place used as a landing site by Maori who were embarking on mahinga kai expeditions at the time of colonial settlement, which under the name Toitu Tauraka Waka became the first site in the South Island, and second nationally, recently recognised as a wahi tupuna (an important place of Maori ancestral significance). The tauraka waka site was gradually swallowed by building and foreshore reclamation as the settlers threw more and more stuff into the harbour, including whole inconvenient parts of the landscape and later, the built environment; both were treated as raw material for what we might identify as, geologically speaking, an anthropocenic armature, a conglomerate “archaeological” landmass that everyone could contribute to: geological cross sections might reveal not just monumental or ‘natural’ things but strata of broken tea cups, glass bottles, and garden wastage. 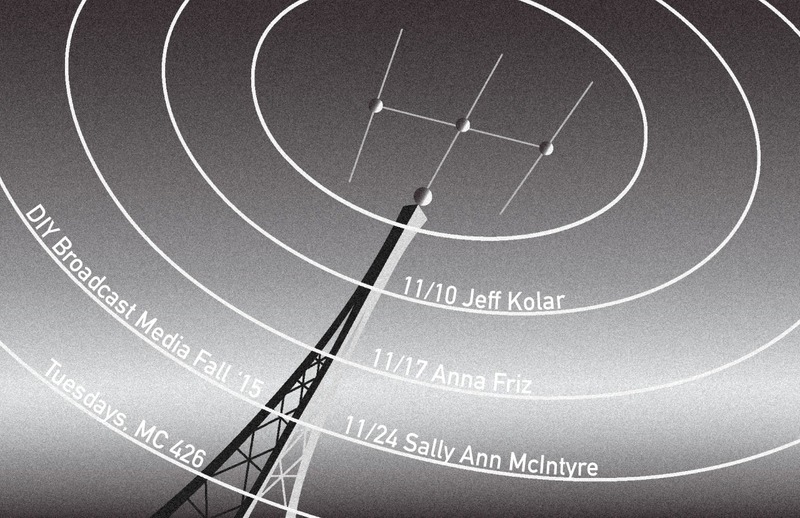 guest artist talk to the class DIY Broadcast Media, School of the Art Institute of Chicago. a colleague in the Transmission Arts, Brett Ian Balogh, invited me to participate in a guest lecture programme for the class, DIY Broadcast Media, which he has taught for many years in the Dept. of Art Technology at The School of the Art Institute of Chicago.